Do you know a woman who is headed off to a college or university that has an Alpha Sigma Alpha chapter? Does this woman exude herself as a woman of poise and purpose, who commits herself to service, scholarship, leadership and friendship? Refer her to an Alpha Sigma Alpha chapter! 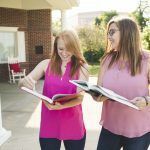 Many of Alpha Sigma Alpha chapters depend on recruitment referrals to better get to know potential new members. As a collegiate or alumna member of Alpha Sigma Alpha, we need your help to find and refer a woman with that Alpha Sigma Alpha personality.